Trams are the least ‘green’ form of transport, and even trains produce only slightly less greenhouse gases than cars, an Australian study has found. 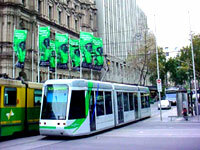 The study by researchers at Melbourne’s RMIT University, shows that – over the long term – trams produce the highest amount of greenhouse gases, followed by trains, cars and buses. Trams are also very expensive to make and cause major traffic problems. “The problem is low occupancy,” Dr Ed Boyapati, a senior lecturer in engineering who led the study, told ABC Science Online. The research compared greenhouse gas emissions from the public transport systems and private cars in the Melbourne metropolitan area. The team counted the number of passengers and the length of their trips, and averaged the result against the amount of greenhouse gas each vehicle produced. They found that trams emit approximately 0.74 kg of carbon dioxide (CO2) per passenger kilometre. Buses showed the least impact, generating just 0.04 kg of CO2 per passenger kilometre, with cars and trains fairly equal at 0.25 kg of CO2 per passenger kilometre and 0.23 kg CO2 per passenger kilometre respectively. But the findings do not mean we should abandon public transport in favour of cars, according to Boyapati. The solution is to increase the ‘loading factor’, or number of passengers, using public transport. The reason for the surprising disparity is that cars always have a passenger in them (the driver), whereas public transport runs at an average of only 25 to 30 per cent capacity. “If we can increase them to between 80 and 90 per cent it will help, but even then trams will be inefficient,” Boyapati said. Reducing the number of carriages on trains and offering dramatically cheaper tickets at off peak periods might also help. While trams on their own are inefficient in greenhouse gas terms, they also have a multiplier effect on emissions by other vehicles. When they stop to pick up and drop off passengers, “up to 40 cars [can] backed up behind a stopped tram,” Boyapati said. After conducting a life cycle analysis of each form of transport, trams were found to add about 80 per cent more greenhouse gas as a result of these flow-on effects. In addition to the high capital cost – about six times that of buses – trams carry about the same number of passengers. The study was inspired by a discussion between tram enthusiasts at RMIT in late 2001, where a state government transport expert noted trams appeared to create a lot of flow-on effects, Boyapati recalled. “Then the question was asked how we know that even buses are efficient, and we decided to pursue that aspect,” he added.